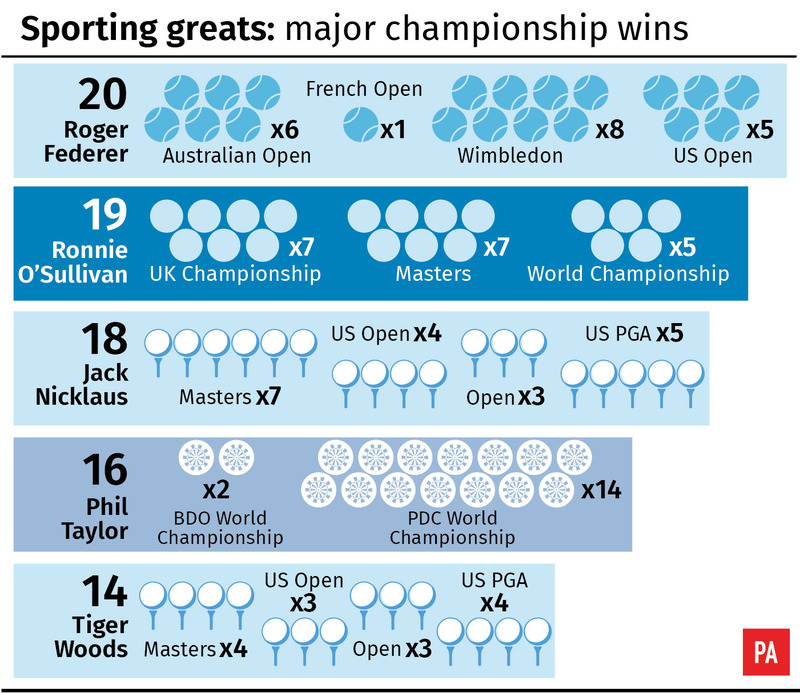 Roger Federer’s 20 majors in tennis were cited as one comparison, along with Jack Nicklaus’ 18 in golf and Phil Taylor’s 16 darts world titles. Ronnie O’Sullivan set a new record of 19 Triple Crown titles with his UK Championship win on Sunday, which saw talk turn to cross-sport comparisons. Here, Press Association Sport looks at how O’Sullivan compares to the other leading names. Quizzed by BBC Sport’s Hazel Irvine immediately after the final, O’Sullivan noted with a laugh that Federer and Nicklaus “have four majors, and I’ve only got three to go at so my strike average is better”. The argument has merit, though Federer has won his titles in a shorter period of time – his first major appearance came in 1999 and his first title in 2003, compared to 1992 and 1993 for O’Sullivan. Interestingly, though, the Swiss star has contested 76 majors for his 20 titles – O’Sullivan has played 75, so victory at January’s Masters would see him exactly match Federer’s record. Nicklaus competed in a huge 136 majors, though many of them came in his later years while playing on his lifetime exemption or as a sentimental starter. “The Golden Bear” won 18 of his first 69 majors for a 26.1 per cent strike rate to that point – Federer’s is currently 26.3 per cent and O’Sullivan 25.3 per cent, leaving little to choose between the trio. Taylor, of course, set his winning record in the World Championship alone, winning two of his first four before switching from the British Darts Organisation to the newly formed Professional Darts Corporation and adding another 14 titles. “The Power” won 16 out of 30 world titles in his career, 53.3 per cent, and reached another five PDC finals. O’Sullivan was hailed by six-time world champion turned BBC pundit Steve Davis as the “Tiger Woods of snooker” after his win on Sunday – Nicklaus’ nearest challenger for golf majors won 14 out of his first 52 before injuries and personal problems took their toll on his career. O’Sullivan is comfortably clear of the field in major titles since his emergence on the snooker scene, echoing Nicklaus’ dominance of golf in his prime. Stephen Hendry, whose record of 18 Triple Crown titles O’Sullivan passed in York, won 10 of those crowns after the emergence of “The Rocket”, while John Higgins and Mark Selby are the other big winners in that time with nine and eight respectively. Nicklaus won his 18 titles between 1962 and 1986, when his main competition came from Tom Watson with eight wins and Gary Player, who won nine between 1959 and 1978. Federer, of course, has not had it all his own way, with Rafael Nadal winning 17 majors since 2005 and Novak Djokovic 14 since 2008. Once again Taylor stands out furthest among his peers. Raymond Van Barneveld remained in the BDO in the early years after the split and won four world titles there – he has added one in the PDC, where John Part, Adrian Lewis, Gary Anderson and Michael Van Gerwen won twice apiece in the Taylor years. Hendry and Davis are the only players other than O’Sullivan in double figures for Triple Crown wins – Davis managed 15 with all but one of them before O’Sullivan’s debut. Higgins and Selby are next in line, though the Scot surprisingly has not added to his haul since 2011. Reigning world champion Mark Williams has joined fellow Welshman Ray Reardon on seven while only six other active players have multiple major wins – and they include Jimmy White, now playing on an invitational tour card.